Students in our Sixth Form will study a broad programme based around A Levels with a range of complementary courses, designed to develop the skills valued and required by universities and employers. These include those set out by the World Economic Forum as being the top ten skills needed to thrive, such as complex problem-solving, critical thinking, creativity, co-ordinating with others, emotional intelligence, and service orientation. The course has been designed to allow the capability to meet the individual needs and interests of students, for example providing the opportunity for international students to improve their English in readiness for examinations and university entry. The programme of study has been developed to provide increased flexibility to suit individual girls’ needs while retaining the important and much valued elements of the School’s ethos. We strongly believe that this combination, with a continued focus on challenge and the individual, will bring the best out of our girls, provide them with the best opportunities and enable us to strengthen our commitment to service and adventure. The School will offer a wide range of A-Level subjects from which girls will normally select three. The following are currently on offer. However, if there is sufficient demand, it may be possible to make other subjects available. Equivalent to half an A-Level, the EPQ provides students with the opportunity to plan, research and develop their own project idea. The EPQ has been designed to teach students how to manage, research, develop, realise and review. • an artefact (for example, a piece of art, a computer game or realised design). The Theory of Knowledge course encourages students to question what they know and how they have come to know it – an understanding through experience; to become aware of what factors influence their understanding. The Theory of Knowledge course inspires students to think about how we know and how knowledge is formed. Theory of Knowledge reflects on the process of learning in all subjects, requiring students to make links throughout their subjects and form independent opinions. This subject gives students the opportunity to think about their own values and shape their identity. Students are often challenged through discussions with other students with different viewpoints, thereby challenging their own values. Encouraged throughout the School, the majority of our students complete The Duke of Edinburgh’s Award. Valued greatly by both universities and employers, the Award has three levels - Bronze, Silver and Gold. 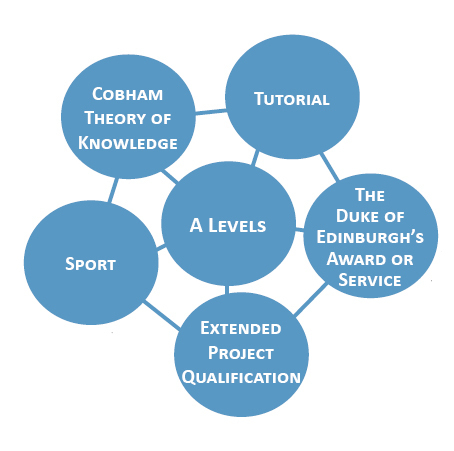 Sixth Form students can continue on the Award and work towards their next level, or can start the Award from the beginning if they have not previously attempted DofE. The Award encompasses four core sections: volunteering, physical, skills and expedition. For those completing the Gold Award, an additional section - residential - is also part of the requirement. For those not completing The Duke of Edinburgh’s Award, the School will be providing opportunities for students to undertake service projects in the local community. All students will participate in a range of sports, and as well as providing the opportunity to compete at Inter-House events, girls may also be able to represent the School in competitions and fixtures with other Schools, or at county or national level. Should students wish to take part in a sport not offered on site, we may be able to arrange these at alternative venues.